The hatred and contempt for men, women and children that was manifested in the Shoah was a crime against God and against humanity. This should be clear to everyone, especially to those standing in the tradition of the Holy Scriptures, according to which every human being is created in the image and likeness of God (Gen 1:26-27). It is beyond question that any denial or minimization of this terrible crime is intolerable and altogether unacceptable. Recently, in a public audience, I reaffirmed that the Shoah must be "a warning for all against forgetfulness, denial or reductionism, because violence committed against one single human being is violence against all" (January 28, 2009). (To members of the delegation of the "Conference of Presidents of Major American Jewish Organizations",February 12, 2009. Joseph Ratzinger/Benedict XVI may yet act publicly with a condemnation of "Archbishop" Robert Zollitsch's denial of the fact that Our Blessed Lord and Saviour Jesus Christ died for our sins. That he did so immediately--and has not done so as of yet--is quite a contrast with how quickly and vehemently he denounced what is to be Bishop Richard Williamson's "Holocaust-denial." Ratzinger/Benedict has more concern for the "feelings" of those who hate the Faith, those who make warfare against the binding precepts of the Divine Positive Law and the Natural Law as these have been entrusted by Our Lord exclusively to the Catholic Church for their eternal safekeeping and infallible explication, those who deny Our Lord's Sacred Divinity than he has for correcting with alacrity a blasphemous heresy uttered by one of his own "archbishops." Joseph Ratzinger/Benedict XVI said that "any denial of minimization of this terrible crime is intolerable, and altogether unacceptable," which is why he responded as quickly and forcefully as did to Bishop Williamson's remarks. He has made a point of secular history a matter of undeniable dogma to which every Catholic in the structures of his false church must adhere while he has reacted, at least thus far, with utter silence to an undeniable blasphemy uttered by one of his own "archbishops" against an absolutely undeniable dogma of the Catholic Church. What takes so long to denounce a blasphemous denial of what Our Lord did on the wood of the Holy Cross when He offered Himself up as the one and only Holocaust to His Co-Eternal and Co-Equal Father in Spirit and in Truth in atonement for our sins? Why the false "circumspection? Does a regard for the falsehood of "episcopal collegiality" take precedence over defending immediately and in no uncertain terms the truth that Our Blessed Lord and Saviour Jesus Christ, the very Second Person of the Blessed Trinity made Man in Our Lady's Virginal and Immaculate Womb by the power of the Third Person of the Most Holy Trinity, God the Holy Ghost, died for our sins? This is what is heard (or, more accurately, not heard) from the lips of Father Federico Lombardi, S.J., Joseph Ratzinger/Benedict XVI's official spokesman, for the past two weeks in the aftermath of the blasphemous heresy that was mouthed by the conciliar "archbishop" of Freiburg, Germany, Robert Zollitsch, when he, on Holy Saturday, of all days, denied that Our Blessed Lord and Saviour Jesus Christ died in atonement for our sins. (Gloria.tv: Chairman of German Bishops’ Conference denies Christ's Expiatory Death). Father Lombardi was quick to denounce Bishop Williamson in the name of the false "pontiff." Who holds back Father Lombardi's tongue now? Could it be none other than Joseph Ratzinger/Benedict XVI? This is what is heard (or, more accurately, not heard) from the lips of Walter "Kasper," the President of the he "Pontifical" Council for Promoting Christian Unity and the President of the Commission for Religious Relations with the Jews, for the past two weeks in the aftermath of the blasphemous heresy that was mouthed by the conciliar "archbishop" of Freiburg, Germany, Robert Zollitsch, when he, on Holy Saturday, of all days, denied that Our Blessed Lord and Saviour Jesus Christ died in atonement for our sins. (Gloria.tv: Chairman of German Bishops’ Conference denies Christ's Expiatory Death). Father Lombardi was quick to denounce Bishop Williamson in the name of the false "pontiff." This is the same Walter Kasper who "re-dedicated" a menorah, a symbol of a false religion that is hated by God, at the new "pastoral center" in the Archdiocese of Boston to honor victims of the "holocaust" who have, Kasper claims, suffered because of the remarks made by Bishop Richard Williamson (see Mocking Our Lord on the Day of His Incarnation). Why was Kasper so quick to denounce Bishop Williamson while he has been silent in response to the blasphemous heresy uttered by his countryman, "Archbishop" Robert Zollitsch? Could the reason be apostasy? In the Los Angeles Archdiocese, Williamson is hereby banned from entering any Catholic church, school or other facility, until he and his group comply fully and unequivocally with the Vatican's directives regarding the Holocaust. Later this year, I, Cardinal Mahony, will visit Israel and pay my respects to the Jewish victims of the Holocaust at the Yad Vashem Memorial in Jerusalem. "Holocaust deniers like Williamson will find no sympathetic ear or place of refuge in the Catholic Church, of which he is not --- and may never become --- a member." Will The Six Hundred Million Dollar Man, Roger Mahony ban "Archbishop" Robert Zollitsch from the facilities of the Archdiocese of Los Angeles that are now in conciliar captivity for his, Zollitsch's denial of Catholic doctrine that Our Blessed Lord and Saviour Jesus Christ died for our sins on the wood of the Holy Cross? This is what is heard (or, more accurately, not heard) from the lips of Sean "Cardinal" O'Malley, the reprehensible conciliar "archbishop" of Boston, Massachusetts, where an egregious "ecumenical" event that will gravely offend God will is currently taking place on three successive Sundays (April 22, April 29, May 6; see http://www.cathedralsaintpaul.org/interfaith-and-ecumenical-presentations-april-22-29-may-6), who called the crimes committed by the agents of the Third Reich as "the worst crime in human history (see No Crime Is Worse Than Deicide), for the past two weeks in the aftermath of the blasphemous heresy that was mouthed by the conciliar "archbishop" of Freiburg, Germany, Robert Zollitsch, when he, on Holy Saturday, of all days, denied that Our Blessed Lord and Saviour Jesus Christ died in atonement for our sins. (Gloria.tv: Chairman of German Bishops’ Conference denies Christ's Expiatory Death). "Cardinal" O'Malley, who maintains the "canonical" "good standing" of the likes of John F. Kerry and Edward Moore Kennedy despite their open support for such evils as baby-killing, both chemical and surgical, under cover of the civil law and for "marriages" among those who are engaged in unrepentant acts of perversity against the Sixth and Ninth Commandments, called the crimes of the Third Reich the "worst" in "human history," thereby denigrating the offering that Our Lord offered on the wood of the Holy Cross in atonement for our sins thathas been denied affirmatively by Robert Zollitsch. This is what is heard (or, more accurately, not heard) from the lips of "Archbishop" Timothy Dolan, the recently "installed" conciliar "archbishop" of New York, who aims to be a "happy bishop" (see Making Everyone Happy Except God), for the past two weeks in the aftermath of the blasphemous heresy that was mouthed by the conciliar "archbishop" of Freiburg, Germany, Robert Zollitsch, when he, on Holy Saturday, of all days, denied that Our Blessed Lord and Saviour Jesus Christ died in atonement for our sins. (Gloria.tv: Chairman of German Bishops’ Conference denies Christ's Expiatory Death). This is a mother lode of apostasy and hypocrisy which must be reviewed at a little length given the fact that the "happy bishop," Timothy Dolan, has been silent about the blasphemous heresy of his fellow conciliar "archbishop," Robert Zollitsch." Then again, the new conciliar "archbishop" of New York has been very busy (going to Yankee Stadium, Cit Field, participating in a "Holocaust remembrance" service at Saint Peter's Lutheran Church, participating in an inter-faith "seder" at the headquarters of the pro-abortion, pro-perversity Anti-Defamation League of the Masonic organization known as B'Nai Brith, about which more will be written shortly). He couldn't possibly have found time thus far to respond with the same kind of alacrity to Robert Zollitsch's blasphemous denial of Catholic doctrine as he did to Bishop Williamson's comments on a dispute point of secular history, right? Timothy Dolan has no idea, as alluded to yesterday in Bookended From Birth to Birth, that the Jewish people of the Old Testament were constantly being punished by God for the worship of false idols and the participation in ecumenical events although theirs was the true religion. Among other acts of apostasy, the Chosen People worshiped the Golden Calf while Moses was on Mount Sinai receiving the Ten Commandments and they worshiped Baal atop Mount Carmel, which is where Elias slew the false prophets and commissioned Eliseus to continue his work in defense of the First Commandment, which is broken regularly by the conciliarists in their esteeming of every false religion imaginable. The post-Nostra Aetate Catholic recognition of the permanence of the Jewish people’s covenant relationship to God has led to a new positive regard for the post-biblical or rabbinic Jewish tradition that is unprecedented in Christian history. The Vatican’s 1974 Guidelines insisted that Christians "must strive to learn by what essential traits Jews define themselves in the light of their own religious experience. "5 The 1985 Vatican Notes praised post-biblical Judaism for carrying "to the whole world a witness-often heroic-of its fidelity to the one God and to ‘exalt Him in the presence of all the living’ (Tobit 13:4). "6 The Notes went on to refer to John Paul II in urging Christians to remember "how the permanence of Israel is accompanied by a continuous spiritual fecundity, in the rabbinical period, in the Middle Ages and in modern times, taking its start from a patrimony which we long shared, so much so that ‘the faith and religious life of the Jewish people as they are professed and practiced still today, can greatly help us to understand better certain aspects of the life of the Church’ (John Paul II, 6 March 1982). "7 This theme has been taken up in statements by the United States Catholic bishops, such as God’s Mercy Endures Forever, which advised preachers to "[b]e free to draw on Jewish sources (rabbinic, medieval, and modern) in expounding the meaning of the Hebrew Scriptures and the apostolic writings." Post-biblical Judaism’s "spiritual fecundity" continued in lands in which Jews were a tiny minority. This was true in Christian Europe even though, as Cardinal Edward Idris Cassidy has noted, "from the time of the Emperor Constantine on, Jews were isolated and discriminated against in the Christian world. There were expulsions and forced conversions. Literature propagated stereotypes [and] preaching accused the Jews of every age of deicide." This historical summary intensifies the importance of the teaching of the 1985 Vatican Notes that, "The permanence of Israel (while so many ancient peoples have disappeared without trace) is a historic fact and a sign to be interpreted within God's design." Knowledge of the history of Jewish life in Christendom also causes such biblical texts as Acts 5:33-39 to be read with new eyes. In that passage the Pharisee Gamaliel declares that only undertakings of divine origin can endure. If this New Testament principle is considered by Christians today to be valid for Christianity, then it must logically also hold for post-biblical Judaism. Rabbinic Judaism, which developed after the destruction of the Temple, must also be "of God." Timothy Dolan has fallen all over himself in presenting himself as the "friend" of those who deny the Sacred Divinity of Our Blessed Lord and Saviour Jesus Christ without ever once seeking with urgency the unconditional conversion of any adherent of the Talmud to the true Faith (which could be because he, the "happy bishop," is not a member of the Catholic Church and does not hold to the tenets of the true Faith). While he, like Ratzinger/Benedict, might say something, perhaps obliquely, about Robert Zollitsch's denial of Our Lord's Redemptive Act on the wood of the Holy Cross on Good Friday, he is certainly taking his time to make such a statement, isn't he? 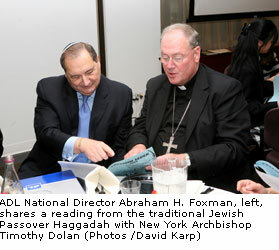 New York, NY, April 22, 2009--Extolling the virtues of unity, religious acceptance and interfaith cooperation, New York Archbishop Timothy Dolan shared a symbolic Passover Seder with a group of Catholic and Jewish students. 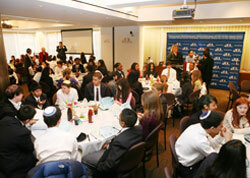 The Interfaith Freedom Seder, organized and hosted by the Anti-Defamation League (ADL), brought together more than 100 seventh and eighth-grade students from the Immaculate Conception School of Jamaica Estates, Queens and Solomon Schechter Day School of Nassau County. "Today, ADL joins our Catholic friends and neighbors in offering our hearty welcome to Archbishop Dolan as the 10th Archbishop of New York," said Abraham H. Foxman, ADL National Director. "We look forward to working with Archbishop Dolan to enhance the ongoing dialogue and programs between the Archdiocese and the Jewish community. The Catholic-Jewish relationship in New York is unique and has contributed to Catholic-Jewish understanding that has set an example that reaches beyond our city." Mr. Foxman led the group in reciting two Jewish blessings made in the Archbishop's honor, and presented Archbishop Dolan with a mezuzah, a traditional encasing of parchment scroll, to affix to the doorpost of his new residence. "This is awesome for me," Archbishop Dolan said. "I have long admired the work of the Anti-Defamation League from afar, and now to receive your welcome and your assurances of our hope for future cooperation, which I enthusiastically share, means very much to me." During the Seder, which occurred one day after Holocaust Memorial Day, Archbishop Dolan discussed the importance of mutual respect and religious acceptance. "Every person deserves dignity and respect. They [the Jewish people] learned the hard way, the tragic way what happens when that fundamental religious belief is not respected, and we now unite with them and hold hands in seeing that that never happens again. "I look forward to our cooperation that's been part of the legacy and the heritage here in the greater New York community." Seder participants asked the Four Questions of Passover, recounted the ten plagues inflicted on ancient Egypt and ate matzo the traditional Passover unleavened bread. Each table contained the traditional Passover Seder plate, as well as multi-colored jellybeans to represent diversity, and twizzlers candy to represent the whips of slavery. Students from each school made presentations about the history of slavery from biblical to modern times. Students from the Immaculate Conception school also led a group performance of two choir pieces. "I have long admired the work of the Anti-Defamation League from afar, and now to receive your welcome and your assurances of our hope for future cooperation, which I enthusiastically share, means very much to me." "Happy 'Bishop'" Dolan, you are are apostate, reflecting, of course, the apostasy of conciliarism itself, which has its apostate apologist-in-chief, Joseph Ratzinger/Benedict XVI, elevate men like Timothy Dolan while keeping silent for over two weeks (and counting) about the hideous blasphemy of Robert Zollitsch that even goes beyond the approved apostasies of conciliarism. "I have long admired the work of the Anti-Defamation League from afar, and now to receive your welcome and your assurances of our hope for future cooperation, which I enthusiastically share, means very much to me"? Do you still stand by this absurd statement that is an insult to the Deposit of Faith that Our Blessed Lord and Saviour entrusted exclusively to His Catholic Church for Its eternal safekeeping and infallible explication, "Archbishop" Dolan? Do you have any trace of a sensus Catholicus left in you to raise yourself like a Catholic man and to even take public note of the work of the Anti-Defamation League to undermine the binding precepts of the Divine Positive Law and the Natural Law, no less to denounce firmly and unequivocally this wretched work that is from the devil himself? How about the following examples of the "work" of the Anti-Defamation League, "Archbishop" Dolan? In our religiously diverse state, such a policy is patently unfair, divisive, and unconstitutional, and it would cost local school districts and taxpayers needless litigation expenses. The First Amendment and federal Equal Access Act provide public high school students with the right to privately pray alone or in groups during non-curricular time and to form non-curricular religious clubs. The clear effect of this policy would be to impose the majority's religious beliefs, which depending on the individual school could be Protestant, Catholic, Jewish or Muslim, upon all students at school-sponsored high school activities. 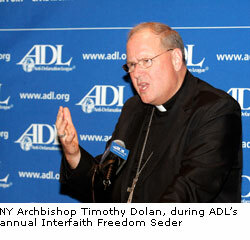 Timothy "I aim to be a happy 'bishop'" Dolan admires the "work of the Anti-Defamation League from afar." Indeed, he admires the "work of the Anti-Defamation League" from such a "distance" that he cannot see or refuses to admit publicly that the Anti-Defamation League is a tool of the devil to promote one objective evil after another under cover of the civil law and throughout the course popular culture and that it is imperative to pray, fast and to make many sacrifices to the Most Sacred Heart of Jesus through the Sorrowful and Immaculate Heart of Mary to pray for their conversion just as the Mother of God herself effected the conversion of the Catholic-hating Jew named Alphonse Ratisbonne on January 20, 1842, by means of the Miraculous Medal as she appeared to him as she does on that Medal in the Church of San Andrea delle Fratte in Rome, Italy. Was Our Lady, the very Mother of God, wrong to have sought the conversion of Alphonse Ratisbonne, "Archbishop" Dolan? Do you even believe that this happened? Was Saint Peter, the first Pope, wrong to have sought the conversion of the Jews in his first papal discourse, delivered in Jerusalem on Pentecost Sunday? Was Saint Vincent Ferrer, O.P., wrong to have sought the conversion of Jews and Mohammedans in the Iberian Peninsula and southern France at the end of the Fourteenth and the beginning of the Fifteenth Centuries? Was the Council of Florence wrong to have issued Cantate Domino, February r, 1432, under the authority of Pope Eugene IV? Was Pope Saint Pius X wrong when he said the following to the founder of international Zionism, Theodore Herzl, on January 25, 1904? Was Pope Saint Pius X wrong, "Archbishop" Dolan? Once again, folks, let's have a little review: Who appointed Timothy Dolan as the conciliar "archbishop" of New York? The same man who reacted with great urgency to the "sins" of Bishop Williamson but who has taken his time, at least up until now, of saying anything publicly about Robert Zollitsch's denial that Our Blessed Lord and Saviour Jesus Christ died on the wood of the Holy Cross to redeem us from our sins, Joseph Ratzinger/Benedict XVI, the great "restorer of Tradition" who is a disciple of the condemned precepts of the New Theology, that he views as a "replacement" for the "crystal-clear" logic of Saint Thomas Aquinas and who can give an allocution on Sacred Scripture without one mentioning its inerrant nature (you can get this speech, published on the Vatican website in Italian, translated in a rough manner to the English language at Yahoo! Babel Fish - Web Page Translation; not one word about inerrancy). Not to be done in all of the apostasy and hypocrisy that exists in the counterfeit church of conciliarism is Robert Zollitsch himself, an apostate who condemns Bishop Richard Williamson for his comments on a disputed point of secular history while he himself accepts "civil unions" for those engaged in unrepentant acts of perversity against the Sixth and Ninth Commandments and denies that Our Lord died for our sins. Ratzinger/Benedict XVI has not removed him for his support of "civil unions." Ratzinger/Benedict XVI has not threatened Zollitsch publicly with excommunication if he does publicly recant his denial that Our Lord died for our sins. Ratzinger/Benedict VI has made no public statement on Zollitsch's denial of the Faith for two weeks while he responded within one week with a denunciation of Bishop Williamson's comments on Swedish television and made obeisances to American Jewish leaders on February 12, 2009, as noted earlier in this brief commentary (I hope someone out there in cyberspace has a sense of humor). The conciliarists are indeed the worst enemies of those who adhere to the blasphemous Talmud as they, the conciliarists, refuse to seek with urgency the conversion of those adherents to the true Church, believing that the Mosaic Covenant is salvific for them. My friends, as I have noted repeatedly, the conciliarists disregard and thrown nothing but contempt and scorn upon the First Commandment. Millions upon millions of martyrs gave up their lives rather than even to give the appearance of credibility or esteem to some false god of some false religion. The conciliarists bow and scrape before these false gods and false religions, making a mockery of the martyrdom of millions of Catholics as such great offense is given God. How is it possible to react so pacifically to Robert Zollitsch's clear apostasy while making it appear as though Bishop Richard Williamson has denied the Catholic Faith by expressing his views on the events of World War II? What is to be said of a "church" which is composed of "bishops" who can deny that Our Lord died for our sins and who feel free to violate the First Commandment with utter impunity, openly and brazenly on repeated occasion? What is to be said of a "church" whose colleges and universities honor pro-aborts such as Caesar Obamus, who will be honored by the University of Notre Dame on May 17, 2009 (see Our Lady Does Not Honor Pro-Aborts and Honors Aplenty for Devils Galore), and the pro-abortion Catholic Donna Brazile at Xavier University on May 9, 2009 (Pro-Abortion Political Activist to Speak at Xavier University, although it should be noted the conciliar "archbishop" of New Orleans, Alfred Hughes, has announced his intention to boycott the Xavier University commencement exercises without, of course, issuing any kind of interdict on Xavier University, Honor for Brazile at Xavier University prompts archbishop's boycott) and the pro-abortion Catholic Vice President of the United States of America, Joseph Robinette Biden, Jr. (see Lest We Forget, Memo to Joseph Biden and Nancy Pelosi and Their Conciliar Enablers, Fact and Fiction and It's Still Absolute Insanity) at Georgetown University, which, of course, covered up the IHS monograph of the Holy Name of Our Blessed Lord and Saviour Jesus Christ to accommodate the wishes of Caesar Obamus in a speech he gave at Gaston Hall there on April 15, 2009 (see Ashamed of the NAME Above All Names). Catholics are never silent in the face of apostasy and betrayal and sacrilege and blasphemy. The Greater Litanies procession will take place in but a few hours after the posting of this "brief" commentary. This is but a small way to render honor and glory to God on the Feast of Saint Mark the Evangelist as we endeavor to make reparation for our own many sins, each of which has helped to worsen the state of the Church Militant on earth and the world-at-large, and for those of the whole world, including those of the counterfeit church of conciliarism, mindful of the fact that we should endeavor pray as many Rosaries each day as our states-in-life permit as we protect ourselves with the shield of Our Lady's Brown Scapular of Mount Carmel against the horrors of the false ecumenism that so characterizes the false church of conciliarism. While each person must come to recognize for himself that the One World Church of conciliarism is false (it took me long enough to do so! ), we must nevertheless embrace the truth once we do come to recognize and accept it without caring for one moment what anyone else may think about us. The Good Shepherd has work for us do in His vineyard. We should be grateful to Him that He has placed us in the midst of the current difficulties as these difficulties present us with a means of giving Him honor and glory and praise through the Immaculate Heart of Mary, enfolding ourselves through that Immaculate Heart into the merciful designs of the Most Sacred Heart of Jesus, understanding that these twin, matchless Hearts of love beat as one.